Goal accomplished! Friday Night Sew-In allowed me to get to my sewing space and sandwich & sew all the lines of three more of these soon-to-be kitty blankets. It's A LOT of straight line sewing. Might have been boring but I watched the Australian Open. For whatever reason, it was difficult to bring up on my TV but perseverance won out! I don't understand why sometimes I try to watch something on that TV and the cable just doesn't want to cooperate. Might be because I don't get down there often enough??? Just a thought. 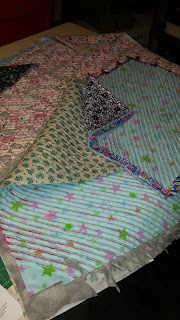 Anyway, here's a picture of all four kitty blankets stitched up now and one binding sewn down waiting to hand sew down in place. Saturday I was able to sew the binding on that one. Note to self: Make the next binding a little wider because there are a lot of layers to wrap around to the other side. Am a little short on this one but I'm sure the fur-baby won't mind! Good morning! I'm going to try to do this all in one day. Don't have time this morning to finish because I get to go to the dentist for a cleaning (♥) after I vacuum this morning. Just got back in from a walk with Gracie (1.71 miles per Runkeeper app) and need to put the warm compress on my nose for 20 minutes. This is because I still have a stitch lodged inside my nostril from my November 23rd surgery! Yoi! Guess that's why there's discomfort and a little redness still. Enough of my non-fun news. Let's get to business! 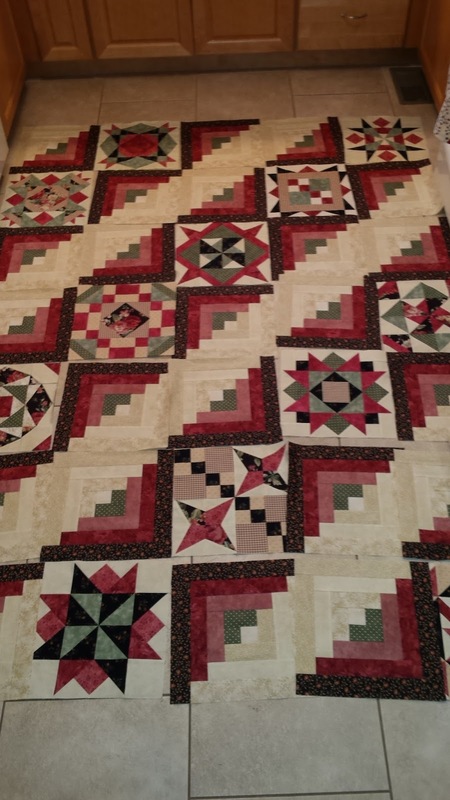 I plan on sitting in front of my sewing machine mindlessly sewing oodles of straight lines. I hope to make 3 more faux chenille kitty blankets. I made one for my kitty this past weekend while at retreat, only lacking the binding. My daughter has two kitties that would love a blanket and my sister has one kitty. Perfect project while enjoying the tennis being played at the Austalian Open! Love watching the four major tennis tournaments!! These socks fulfilled the "Bobble Stitch" requirement. Sometimes bobbles are called "Popcorn Stitches". Regardless, I knit bobbles at the top of the cuff. 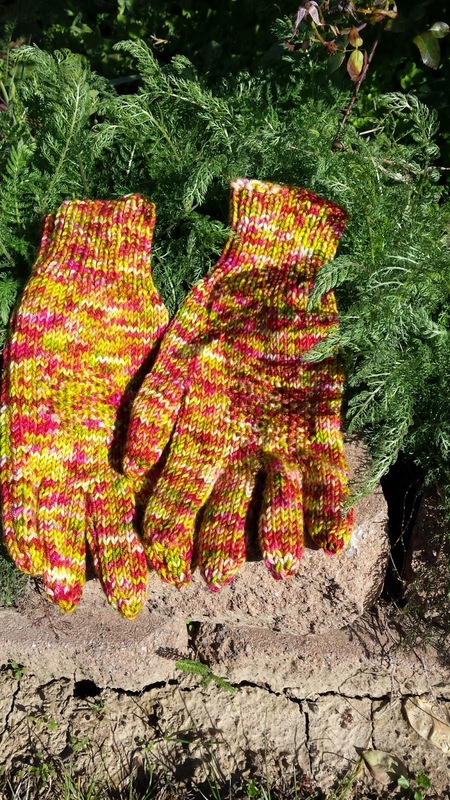 This pattern, Cableship, can be found HERE on Knit Purl Hunter's Knit-a-Long. Her socks did not include the bobbles. I just threw them on to fulfill a Loopy Academy requirement! Our last requirement for the semester was to knit a toy. This pattern can be found on Ravelry HERE . What a fun project! 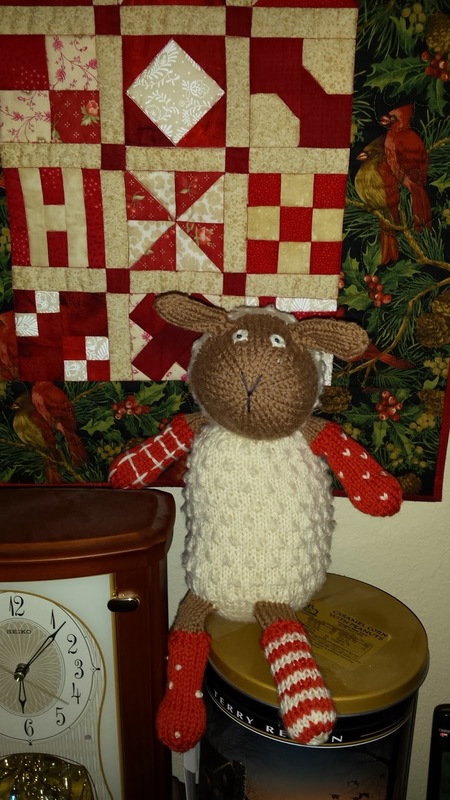 In case you're unfamiliar with The Loopy Ewe (a yarn store in Colorado that used to be here in the St. Louis area), this "toy" is the mascot for the store! 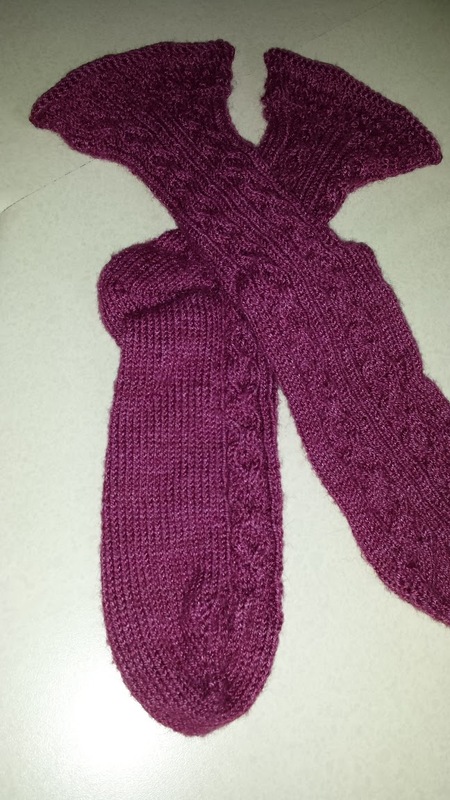 It was a quick knit and practically seamless, which is what made it appealing to me. Hate that seaming stuff! Anyway, I think it turned out awfully cute! Here's one of my projects I'm knitting on right now. These are Cadence Socks by Very Busy Monkey. You can find the pattern HERE . 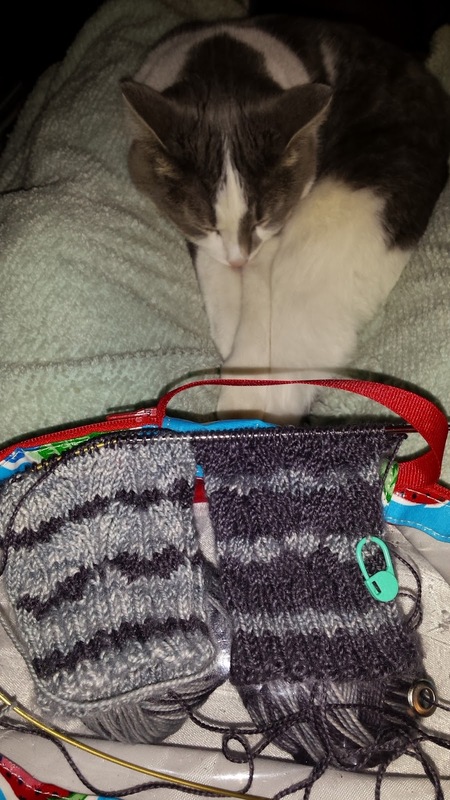 These socks have joined two Knit-a-Longs ... one with Very Busy Monkey (I have until March 31 to finish these) and one with The Loopy Ewe (My 2017 Sock Challenge which requires one to knit a pair of socks each month). The yarn is comes from The Loopy Ewe and is called Inversibles. It is 2-color yarn and they are dyed exactly opposite. The Loopy Ewe has loads of color pairs. Check it out if you like HERE. So many pretty choices!!! Polly practically blends in with the silver & black! The first picture is all the blocks laid out on my kitchen floor. 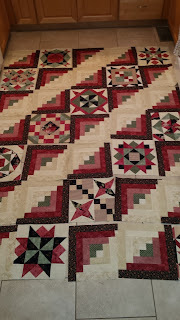 The next one is the blocks sewn together at retreat. Let me tell you my furrows were not always straight. Had to resew three different blocks to get it right! UGH! How do you like my piggy pillow? It's called Farmer's Market. I bought the pattern from Norma Whaley who publishes under Timeless Traditions. I love her stuff!!! It was a fun project and I love the way it finished. Check it out! 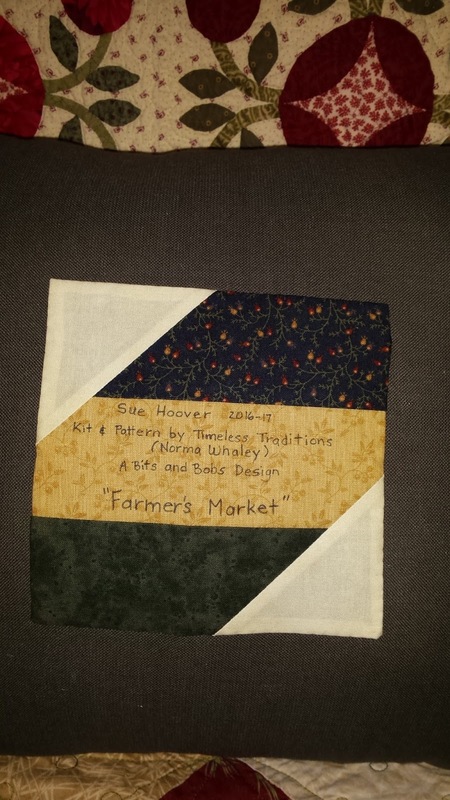 I used a leftover quilt block from another project for my pillow label! "Love One Another" pillow is another Timeless Traditions pattern. I've got this one in the works and I actually sewed the green stems & leaves on already. Will be working on this periodically and would love to say I'll have it finished by Valentine's Day! Currently I'm also knitting a shawl with my Warm Woolies December yarn. I just saw that the January yarn is ready for shipping. Whew! And I haven't even broken out my cross-stitch yet! High hopes!!! I hope you get a chance to stitch to your heart's delight! Pretty, huh? Weird though. I tried to concentrate my 2017 UFO list to consist mostly of completed tops so I could have 2017 be the year of quilting finishes! 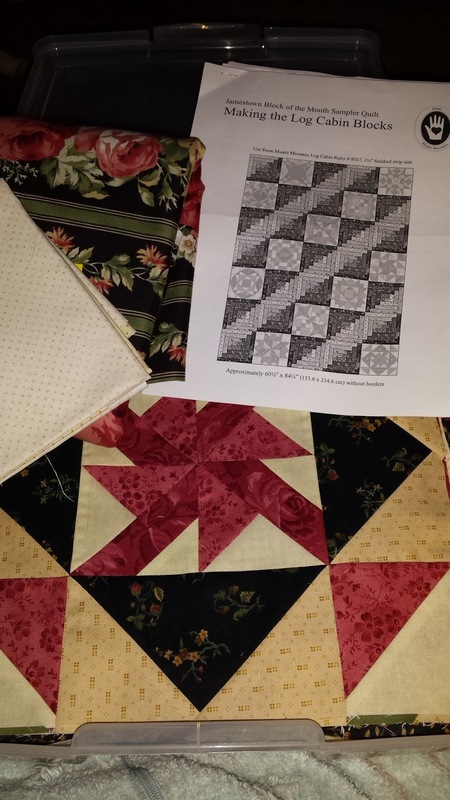 Wouldn't you know the first project selected is one that I have to assemble the top and then decide & sew on borders before I can even think about quilting! I have retreat this month so I hope to get this top together then. I am knitting Cadence Socks by Very Busy Monkey using yarn purchased at The Loopy Ewe. It's called Fibernymph Dye Works. It's a hand-dyed yarn that the colors mirror each other. They have all sorts of colors but I chose a neutral combo. Loving the pattern so far but I haven't gotten far along yet. It also double-duties in a Very Busy Monkey knit-a-long, which only challenges you to knit a new or in-progress VBM sock pattern. Perfect! One project = two challenges. I can do this! I also decided to join the Warm Woolies Club through TLE also. Around the middle of December, January, and February they will send me (for a fee, of course) a skein of yarn plus extra goodies. There's a Group Page where they suggest Ravelry patterns to use that skein up. FUN! Another skein I need to wind up. They sent me a skein of Blue Moon's Fiber Arts Super Sparkle in pinks to purples with silver sparkle flecks throughout. I plan on knitting a Reyna cowl with this. You can find the pattern here . My third knitting project-to-be means getting another skein of yarn wound up. I got a free pattern when I participated in the One for You, One for Me KAL where, if we knit up 2 or more of Laura Aylor's cowl patterns by a specified date, she gave us a free pattern. She is a wonderful designer and I have the yarn, just need to cast on! 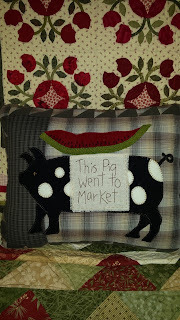 I did manage to FINALLY finish wool applique pillow kit. It's called "Farmer's Market" by Timeless Traditions, aka Norma Whaley. It was a FUN pattern and I thought the pillow turned out cute! 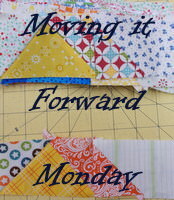 I've lately been trying to work more diligently on my Mosaics applique project. I was so inspired by my friends' progress that I thought I should also get a move on it. Loving it also and will share pictures at a later time when there is some real progress to be shown. 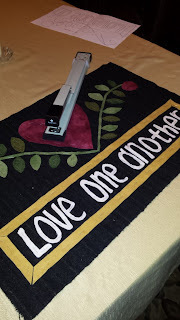 And because that's not enough, I plan on pulling out a cross-stitch project to work on too! Nothing like a new year, a new slate, and I may need a new brain! 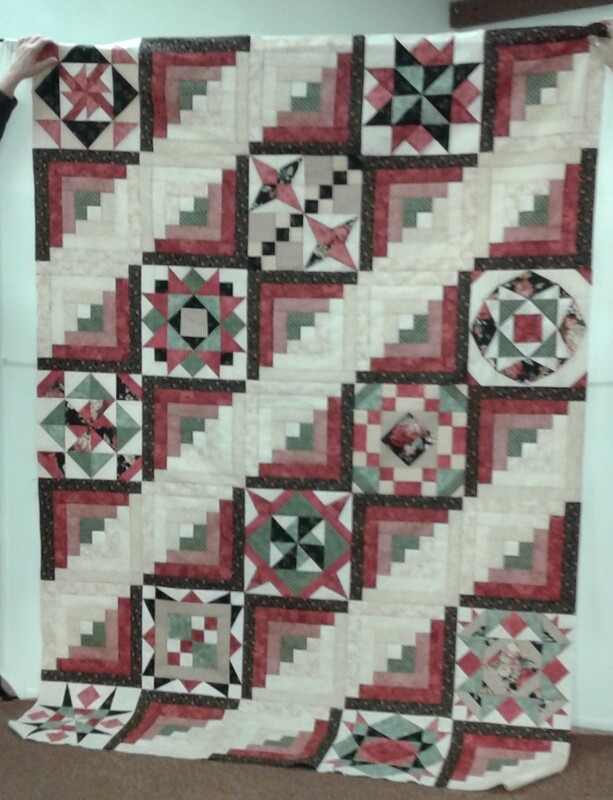 Did I also mention that I want to start a new bed quilt? 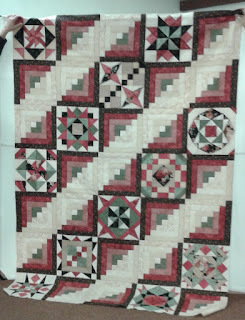 I think I'll quietly work on Split 9-Patch by Bonnie Hunter. I should be able to do this in between my other projects. I'd really like to use up some of my scraps this year! High hopes, right?